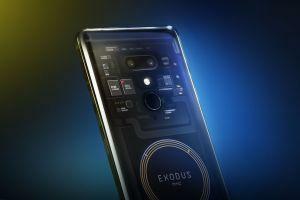 HTC, a Taiwanese consumer electronics company, unveiled its flagship blockchain-focused smartphone today, called the Exodus 1. Also, the phone maker said it developed its own cryptocurrency wallet called Zion so the phone could double as a hardware wallet. The phone comes with a separate micro operating system running parallel with Android, made by SoftBank's Arm Holdings, to keep a customer's cryptocurrency safe. This so-called secure enclave is to add another layer of security because the Android operating system is “fundamentally insecure with a centralized system,” according to Phil Chen, HTC's decentralized chief officer. Talking to CNBC, Chen said that integrating blockchain into the phone is that it bolsters the security and privacy of a user's assets, and will in the future help with protecting a customer's data and identity. “And the reason why you do a blockchain phone is for everybody just to own their own keys. Everything starts there. When you start owning your own keys, then you can start owning your own digital identity, then you can start to own data,” Chen added. The phone itself will run dapps (decentralized applications) and offers a “Social Key Recovery” function for a user to regain their funds in case they lose their private key via a select number of trusted contacts. A 16 megapixel dual main camera and an 8MP dual front camera with 4K video. A six inch display with quad-HD+ resolution. A Qualcomm Snapdragon 845 processor. 6GB of RAM and 128GB of storage. Exodus 1 is early access, however, and is expected to be shipped by December. It costs BTC 0.15 or ETH 4.78, which is around USD 960. The phone is sold in crypto only. “Selling it in crypto only and being the first to do so means we are bringing this directly to the core audience and those who will want this device - the blockchain community,” Chen said. As this is the early access version of the device, HTC hopes cryptographers and developers from all over the world will join in on the discussion to help improve the strength of the secure enclave. HTC will soon release APIs (application programming interface) to allow third-party developers to use the EXODUS 1 specific hardware to protect keys and sign transactions in order to boost the technology further. Earlier this October, Pundi X, a developer of crypto payments solutions, has demonstrated a blockchain-powered smartphone called the XPhone.